The PDP presidential candidate, Atiku Abubakar, and his entourage shortly after they arrived at Sani Abacha Stadium, venue of the PDP rally in Kano. LAGOS FEBRUARY 10TH (NWSRANGERS)- overwhelmed by heavy crowd as he arrived at Sani Abacha Stadium in Kano, venue of his rally. 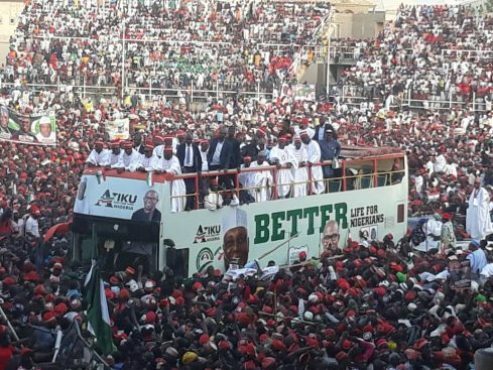 Atiku was accompanied by his running mate, Peter Obi, Senator Rabi’u Musa Kwankwaso, the National Chairman of PDP, Uche Secondus, Atiku’s campaign director, Otunba Gbenga Daniel and Senate President Abubakar Bukola Saraki. Atiku and his entourage arrived the stadium at exactly 5:50pm. The former vice president was received by mammoth crowd of PDP supporters.